Today we celebrate the International Women’s Day, and this year’s campaign theme is #BalanceforBetter. Find out more about our pledge to empower BAME women locally and regionally! 3. a detailed framework of the social and financial benefits it will bring to the city. We would like to thank all the participants who joined the design workshop for the BAME Enterprise Hub. 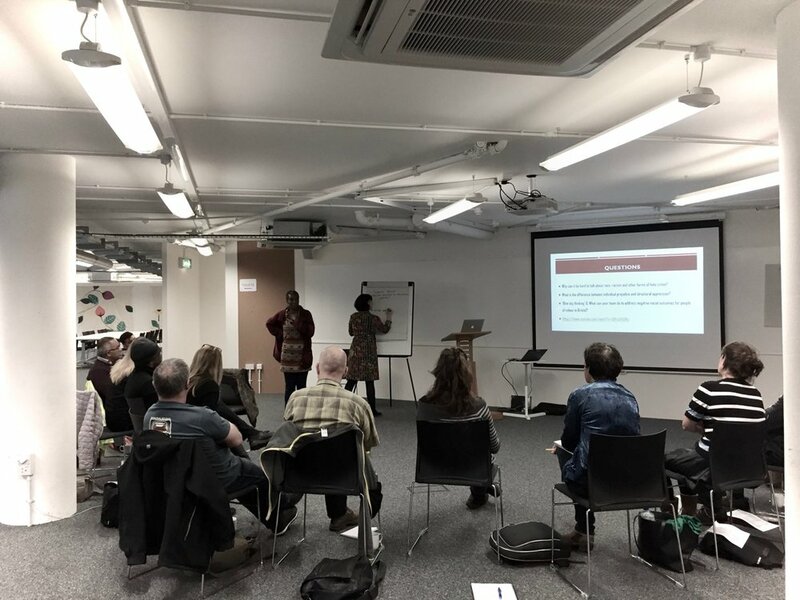 BSWN wants to ensure that the Hub remains fully owned by the BAME Business community in Bristol, and therefore looks forward to collating your views to inform the final prospectus. Understanding and deepening knowledge about ‘what works’ in communities to disrupt divisive/ discriminatory/ non-inclusive behaviours and structures and what builds inclusive one. To enquire about our Inclusive training offer, please email training@bswn.org.uk. CORE a coalition of race equality organisations from across the UK met on 18 February to reflect on the state of racism in Britain today, and how we as a society are responding to it. Our director Sado Jirde has joined the growing groups of local advisors for Avon Mutual, formed to establish the first ever customer-owned high street bank dedicated to Bristol, Bath, Gloucestershire, Wiltshire and North Somerset. Human Bias in Artificial Intelligence (AI): Can we fix it? BSWN and Knowle West Media have partnered to contribute to Digital Cities Bristol 2018 - a week of free training, networking and events aimed at developing the skills of current and future content makers throughout the creative industries. The session was jointly curated in order to discuss the impact of Artificial Intelligence (AI). This year, our colleagues at Babbasa celebrated a 5th Anniversary with the launch of an incredible campaign titled ‘Hear Our Stories’, that aims to inspire hope by sharing powerful stories of people often disadvantaged in society. In collaboration with the award-winning Plimsoll Productions, Watershed and The Festival of Ideas, Babbasa hosted a fantastic evening with a short film screening and a panel discussion. The West of England Initiative is a business leadership team which enables the business community to positively influence the way our area is shaped, managed and developed. On the 6th of December 2018, the Initiative celebrated its 30th Anniversary with a fantastic event hosted at the new Weston Studio Theatre at The Bristol Old Vic. Bristol & Bath Regional Capital (BBRC) celebrates its 3rd Anniversary! On 5th December 2018, BSWN was delighted to be invited to the 3rd Anniversary event of Bristol & Bath Regional Capital (BBRC), whose ambition is to become a significant and commercially sustainable driving force in the development of the region, catalysing regional change through civic-led, commercially-focused and innovative investment. On 7th November 2018, University of Bristol held its second Policymakers’ Question Time event, with an audience of policymakers and academics, aiming to create new connections and creating closer cooperation between research and policy. Our director Sado Jirde contributed as a panelist at a 3-strong panel that ask questions of four speakers, whose diverse subject areas reflected the breadth and complexity of policymakers’ roles. This October, BSWN had the privilege and the joy of hosting a young aspiring philosopher and poet Mo Ali as part of the Bristol Somali Festival 2018. This young Somali visionary would eventually I would like to be recognised as a philosopher. International Volunteer Day (IVD) is traditional celebrated on 5th December each year, and was designated by the United Nations in 1985 as an international observance day to celebrate the power and potential of volunteerism. Diversity in business is proven to boost innovation, improve decision-making, drive productivity and increase profitability. Our director Sado Jirde, the founder of 91 Ways Kalpna Woolf, and Dr. Zainab Khan recently featured in an article by Bristol 24/7 discussing the importance and lack of BAME representation in business. The 2018 Global Parliament of Mayors (GPM) summit officially opened on Monday 22nd morning with Bristol Mayor and GPM treasurer Marvin Rees welcoming all the mayors before a key note speech from Mayor Steve Benjamin of Columbia, South Carolina (USA). A summit that brought together 100 global city leaders, together with Business Leaders, Academics, Community Leaders and Civil Society to address some of the key global challenges facing our cities such as migration, public health, climate change, governance, urban security and inclusive economic growth through empowering cities to be the drivers of change. On Thursday 11th October, Jeremy Corbyn visited Bristol to express his commitment to adjust the history curriculum taught in schools to be broader and less Euro-centric. He further mentioned his party’s support for a new Emancipation Educational Trust to educate next generations about slavery, the fight for its abolition, and the role of the British Empire and colonisation. The Bristol BME Powerlist is organised by University of Bristol, Bristol Students' Union and Bristol 24/7 and launched on 1st October to honour the beginning of Black History month. Our director, Sado Jirde, contributed as a member of a panel for the Activism and campaigning strand. The Black South West Network recently hosted a series of roundtables assessing how the Metro Mayor can get to grips with racial inequality in the region once elected. BSWN (a Regional BME Infrustructure Organisations based in Bristol) has been fortunate to continually gain HLF support for our varied projects in the last 4 years. Support from development officers has been the most useful in our case, from the initial stage when you make an initial funding enquiry to throughout the project development up to the final project submission. Capacity issues remain problematic for small BAME organisations, meaning that not only do they have limited capacity to engage with networks and information sessions, but they also have limited capacity and experience in constructing funding applications. The provision of support in this regard formed a critical element of BAME infrastructure organisations work. With the cuts in funding and the change of focus away from infrastructure funding, BAME infrastructure organisations no longer exist/have enough capacity themselves to support the smaller BAME orgs. Providing capacity grant pots for BAME infrastructure orgs to administer/deliver could provide mechanisms through which more high quality grants can be submitted. In addition to this practical measure, it must be acknowledged that HLF and the National Lottery as a whole, are perceived as inaccessible mainstream structures, which itself deters some BAME orgs from applying. Addressing this issue is a large piece of work, steps towards which have been taken, however, a BME led review of this issue and change processes are required to ensure that the process can be completed effectively and that HLF is perceived as an organisation that is equitable in its structure, culture, and delivery, as well as in its and setting of priorities and allocation of resources.